There are few HVAC companies serving the Santa Barbara area that are able to compete with Anacapa Heating & Air's quality of service and level of expertise. Our services are provided by highly experienced HVAC technicians who are factory trained and NATE certified. You can count on them to be thoroughly familiar with all major heating and air conditioning brands, and the industry's best practices for diagnostics, repair, maintenance, and installation. As a result of our exceptional HVAC services, we've earned more than 20,000 satisfied clients, an A+ BBB rating, and the coveted Carrier Factory Authorized Dealer title. Give licensed and insured Anacapa Heating & Air a call today for any heating and cooling service need in or near Santa Barbara. Whether we are repairing a broken air conditioner, inspecting a furnace, or replacing old HVAC equipment, we will always deliver quality workmanship and long-lasting results. Moreover, we keep our prices fair and affordable. Our normal business hours are 8am to 5pm, Monday through Friday, and we're on call seven days a week to respond to emergency repair requests. We offer two-hour appointment windows and call our customers in advance if we're running late. We've served customers throughout Santa Barbara & Ventura County since 1998. We have over 20,000 satisfied residential and commercial customers. We're a Carrier Factory Authorized Dealer. We stand behind our installations with a 100% satisfaction guarantee for one year. We expertly repair and maintain all major HVAC brands. Our technicians are factory trained, NATE certified, and highly experienced. We offer upfront, flat-rate pricing and cost-effective, personalized solutions. We are a family owned and operated, local business. We are a fully licensed and insured HVACR contractor. Additionally, as a licensed mechanical contractor, we're qualified to install, replace, repair, and maintain ventilation systems, grease ducts, exhaust fans, boilers, rooftop packaged HVAC units, commercial kitchen exhaust ductwork, and more. Because all of our HVAC service technicians and installers are carefully screened, thoroughly trained, NATE certified, and highly experienced, you can trust them to get the job done right the first time, every time. Anacapa Heating & Air offers expert heating and air conditioning repair services for all major brands, including but not limited to Carrier, Bryant, Trane, Lennox, American Standard, York, Goodman, Amana, Rheem, Ruud, Maytag, Day & Night, Mitsubishi Electric, and Fujitsu. We charge just $69 to have one of our NATE-certified service technicians come out to your Santa Barbara property and perform a complete diagnostic of your system in order to determine what repairs are needed. We use flat-rate pricing and provide an upfront, written quote for your consideration. Our technicians are never given sales-based incentives so they stay focused on only recommending the most cost-effective solutions. If you decide to move forward with our repairs, we will apply the $69 diagnostic fee towards the total repair cost. Since our technicians arrive in a service van that is fully stocked with the most commonly needed parts, we're able to complete the majority of repairs during the first visit. Our techs work fast and efficiently without compromising on quality and take extra measures to keep their work space clean. Call us today at (805) 485-6333 to book your furnace or air conditioner repair in Santa Barbara or the surrounding area. Whether you are looking to add heating and/or air conditioning to a home or room addition or feel it's time to replace your old, inefficient furnace or air conditioner, call Anacapa Heating & Air. 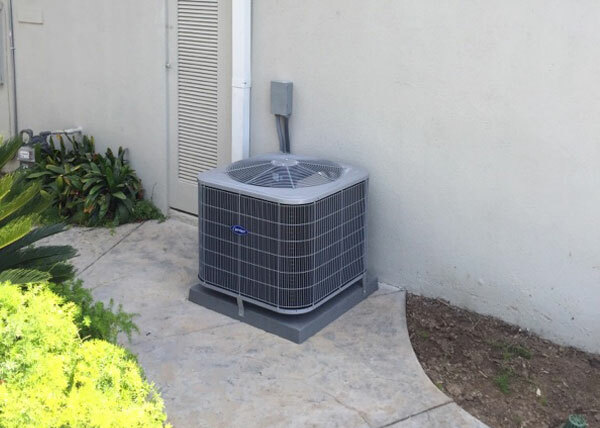 We offer free on-site consultations and estimates for properties throughout Santa Barbara, and stand behind our HVAC installations and replacements with a 100% satisfaction guarantee for one full year. Anacapa Heating & Air is not only a licensed heating and air conditioning contractor, but also a Carrier Factory Authorized Dealer. In order to earn Carrier's factory endorsement, we had to demonstrate a commitment to superior customer service, solid business practices, selective hiring, ongoing training, and their high-quality, reliable, energy efficient and environmentally sound products. Because we have met their high standards, you can feel confident that you are working with a well-qualified installer. Call to schedule your consultation today. When we come out, we'll take the time to develop recommendations to meet your specific set of needs. We have options to fit most budgets, and can connect you to flexible financing options available with approved credit through Wells Fargo Bank, N.A. Santa Barbara is known for its Mediterranean-like climate, which means that it is typically warm and dry during the summer months and cool and wet during the winters. With such moderate temperatures throughout the year, it can be tempting to scale back on your HVAC preventative maintenance schedule. But, if you want to keep your system running reliably and efficiently, as well as prolong its life, it's still best to have your heating system tuned up every fall and your air conditioning system tuned up every spring. Our comprehensive $79 HVAC tune-ups include air filter replacement, safety inspections, tightening of electrical connections and any loose hardware, fluid replacement, replacement of worn belts, and lubricating motors and bearings. 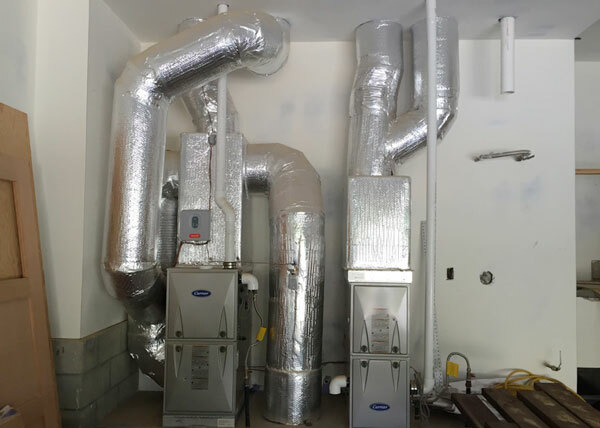 Click here to learn more about our air conditioning maintenance services and here to learn about our furnace maintenance services, available for residential and commercial clients throughout Santa Barbara. Because we believe in the value of regularly scheduled preventative maintenance and always want to give our Santa Barbara customers the best value possible, we've created the Preventative Maintenance Club. Club membership is customized to meet the needs of each client. Residential maintenance agreements typically include an air conditioner tune-up in the spring and a furnace tune-up in the fall, while a commercial maintenance agreement could include two, three or four tune-ups a year depending on their needs. In addition to getting a discount on preventative maintenance, Club members also receive a 10% discount on replacement parts and materials used for repairs and priority scheduling. Call us today to learn more! 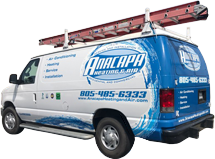 Anacapa Heating & Air's factory-trained, NATE-certified technicians have years of experience installing and repairing mini-split air conditioners and heat pumps for residential and commercial clients in the Santa Barbara area. Our techs are qualified to help you find cost-effective and energy-efficient mini-split systems to heat/cool multiple spaces without using a centralized ducting system. Ductless mini-splits are a practical solution for heating and cooling garages, home offices, sun rooms, and more. We offer free-onsite estimates for clients interested in a mini-split installation, during which we will perform a professional load calculation to assess your property and recommend the system that best matches your needs. At Anacapa Heating & Air, we have over 20 years of experience installing thermostats that help our residential and commercial clients achieve ideal indoor climate control in their Santa Barbara homes and businesses. We understand that a properly functioning thermostat is crucial to the overall performance of your heating and cooling system, and will help you select the best thermostat for your central heating and air conditioning system, your lifestyle, and your energy-efficiency goals. We sell and install a diverse range of non-programmable and programmable digital thermostats from major brands, including Nest, Honeywell, Carrier, Venstar, and more. Additionally, we stay up-to-date with the latest technological developments in the industry and are qualified to install new thermostats that feature Wi-Fi capabilities and learning/smart controls. Call today to learn more. Came out within 2 days. Their service rep was organized and thorough. Thank you Anacapa heating and air! Second time you have come through for us.